This course focuses on the classroom management areas of teacher roles and teacher language. It considers: the skills and responsibilities related to classroom management; setting up activities; effective teacher language. 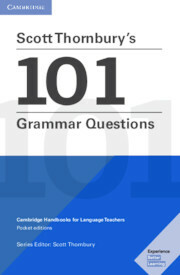 A compact, user-friendly book addressing many of the questions about grammar that regularly confront teachers, both novice and experienced.